Did Grover get to Rand Paul? Or, was it big business donors (meatpackers maybe?) who caused Paul to go wobbly on the refugee issue? Daniel Greenfield writing at Frontpage magazine directs us to a brief news story from Presidential candidate Rand Paul’s home town. Welcome to Bowling Green, Kentucky, the latest front in the Sunni – Shiite unholy war tearing apart the Middle East. He then directs us to this news story about how a Shia Muslim claims he was assaulted by a Sunni Muslim in a dispute about their religious beliefs. Now how many Sunnis and Shiites do you need for there to be enough critical mass for these conflicts to turn violent? Why is this so interesting to me? The article does not tell us the nationalities of the two who scuffled, but I will bet a buck they were both Iraqis because we know many Iraqis have been resettled in Kentucky including those two refugee terrorists arrested in Bowling Green in 2011, on trial here in 2012. At that time there was a glimmer of hope for Senator Rand Paul on this issue as he was very vocal in asking: Why are we bringing so many Iraqis to the US? See this post! I was originally thrilled! Now he has completely shut up on the issue! By the way, Kentucky is an important refugee resettlement state and neither Senator Mitch McConnell or Senator Paul say a word about it. The US State Department is admitting almost equal numbers of Shiite and Sunni Iraqis to the US, so you can expect more conflicts ahead! Is that insane or what! Again, we don’t know if these two Bowling Green squabblers are Iraqis, but this (below) will give you some idea of our foolishness. I couldn’t get the State Department data base to open just now, but found my notes from a search I did at the beginning of March. All the other religions, or no religion accounted for the remaining 5,172 (23%). So, is this kerfuffle in Kentucky the tip of the iceberg? We’ll see! See our Kentucky archive here, and don’t miss this post about the suspicious donation (for Syrian refugees) to a contractor from a Muslim “charity.” See also Kentucky mosques cropping-up due to growing Muslim refugee population. Make this issue (immigration and national security) a top concern for 2016 Presidential candidates! If you have an opportunity to meet candidates ask them what their position is on refugee resettlement (look for a deer-in-the-headlights look!). See NumbersUSA scorecard, here. Paul has an abysmal D+ on immigration and jobs. About the photo: One of the earliest important stories we ever wrote nearly 8 years ago was about Grover Norquist lobbying for large numbers of Iraqi refugees to be resettled in the US. And, see Grover here with RINO pals (including Jeb Bush) just last year urging the GOP to support the idea of more refugees coming to America! Grover has been spreading the lie that Ronald Reagan signed the Refugee Act of 1980 into law. He is wrong. It was outgoing President Jimmy Carter who is responsible. They weren’t hunting rabbits or deer, but birds, turtles and frogs! With slingshots! What the heck, where is their resettlement agency? Doesn’t it teach them that this isn’t done in America? Aren’t they being fed enough, they get food stamps! And, what must the environmentalists of Massachusetts be thinking? Where is PETA, by the way? Longtime readers know that Springfield, MA (in the land of Ted Kennedy the ‘brains’ behind the Refugee Act of 1980) has been a ‘pocket of resistance’ to more refugee resettlement as the Mayor has begged the resettlement contractors to slow the flow to the overloaded town. See our complete Springfield archive here. Previously we learned that the resettlement agencies working in Springfield included Jewish Family Service of Western Massachusetts and the renamed Lutheran Social Service of New England (see here where the CEO of Ascentria Care, the new name, says refugee resettlement is BIG BUSINESS!). Clearly they are doing a pretty awful job of assimilating the refugees they resettle! SPRINGFIELD – Three men were arrested and charged with illegally hunting in Forest Park Wednesday afternoon after police allegedly found them in the park shooting animals with slingshots. The three men, Patty Poo, 54, of 211 Oakland St., Kehney Moo, 38, of 83 Acushnet Ave., and Hsa Wah, 60 of 85 Acushnet Ave., were each charged with cruelty to animals, hunting without a license, violation of Forest Park hunting ordinances, and breach of the peace while armed with a sling shot. According to Springfield Police spokesman Sgt. John Delaney, police were called to a section of Forest Park at about 2:15 p.m. after receiving calls about people seen hunting birds in the park. Officers responded to the area and found Wah, Moo and Poo with a bag containing dead turtles, frogs and birds, Delaney said. The three were armed with slingshots and were apparently using small rocks and auto lug nuts for ammunition, he said. Be sure to see this story at MassLive about how much commentary this story has generated. And, note that the case is on hold because a proper translator must be found! Remember ‘welcoming’ communities! You must pay for interpreters when your refugees get in trouble with the law, have problems with medical care, and have issues in the school system! Maybe the resettlement contractor responsible for the trio should be billed for their court costs instead of the taxpayer! We are told that these three are Karen (Christian) Burmese. They make up most of probably the largest ethnic group we have resettled since 2005. (Although Iraqi refugees are catching up). How many Burmese refugees are we taking? The mostly Christian Burmese are one of the largest (if not the largest) ethnic group of refugees we have resettled since 2005 (I checked the data from January 2005 until May 1, 2015). This is what I learned: We resettled 140,812 Burmese refugees since 2005. This surprised me: In that number were 12,615 Burmese Muslims! First, a new wave of illegal aliens flooded Italy and Greece this week. Obviously no effort is being made to take Australian Prime Minister Tony Abbott’s advice to turn the boats back to the African coast. Each successful rescue simply sends the message back to Africa to fill the next boat! More than 4,200 migrants are being brought to southern Italy after being rescued from boats in the Mediterranean in just 24 hours, the Italian coastguard said. The migrants were rescued from wooden fishing boats and motorised rubber dinghies on Friday and Saturday in operations involving ships from nations including Italy, Ireland, Germany, Belgium and Britain. Distress calls were made from 22 different boats, many off Libya but also off the southern Italian coast. The huge spike in the number of people trying to cross the Mediterranean Sea in recent weeks has been attributed to the worsening security situation in Libya – the staging post for most of the crossings – as well as milder weather. While massive, this year’s numbers are level with last year when authorities registered 41,243 arrivals between January and May 31. 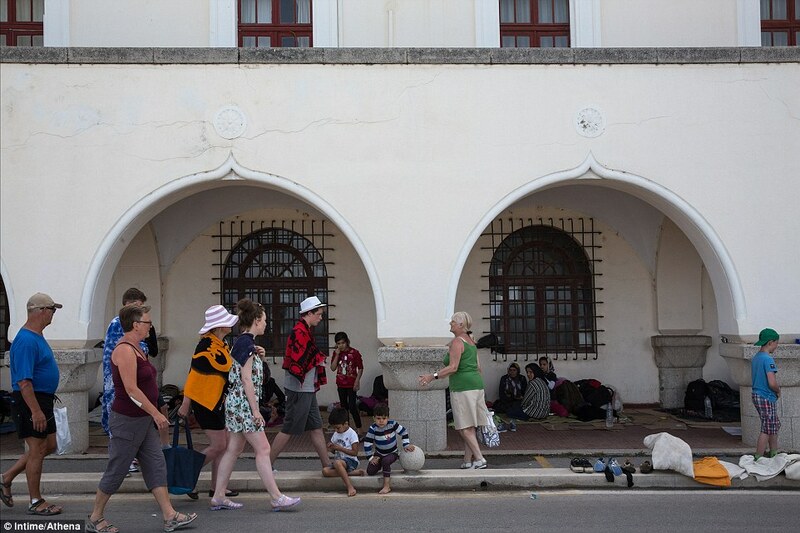 A difference is however being felt in Greece which has registered 37,000 arrivals since the beginning of the year – already 3,000 more than in the whole of 2014, di Giacomo [International Organization of Migration] said. The EU’s attempt to divide the masses between the 28 nations of the European Union is going no where. See the Daily Sabah. Most EU countries are balking. And, besides, with the huge numbers coming, relocating 40,000 sounds like only a drop in the bucket! The first significant sign of progress on the issue of mass migration to the EU was achieved on Wednesday after the submission of a proposal for a relocation and resettlement scheme to respond to the current migration challenges that the EU is currently facing. As part of a wider ranging migration strategy, the relocation scheme proposes to accept 40,000 asylum seekers and relocate them throughout EU countries in order to share the heavy burden of migrants mostly arriving in Italy and Greece. The proposal has not yet been approved by EU member states and is a controversial issue as the majority of EU countries are reluctant to take in refugees. According to the resettlement program under the EU action plan on migration, Germany, one of the largest recipients of asylum applications among EU countries, would receive 8,763 of them, France would take 6,752 and Spain 4,288. The rest would be distributed among the other 23 countries. However, Britain, Ireland and Denmark already opted out of the plan with other Eastern European EU countries opposing the resettlement scheme. Member states would receive 6,000 euros per relocated asylum seeker from the EU. Then we have news that Spain is undesirable according to Syrian refugees: not welcoming enough, not enough welfare goodies? Here, Poland is balking at the EU proposal, but did agree to take in 200 Christian Syrians. The EU wants them to take 2,659 mostly Muslim Africans and Syrians. There are lots more stories about individual country responses to the EU plan to share the burden. I’ll add more here as I see them this week. Our entire ‘Invasion of Europe’ archive is here. You won’t see much about this in the American press, but it’s important to know that Western civilization is under siege across Europe, Australia, and in Israel. Update: See ‘Welfare jihad in Europe’ here.